Historically public art, whether murals or mosaics, empowers folks. Often public art is the voice piece for those often unheard. 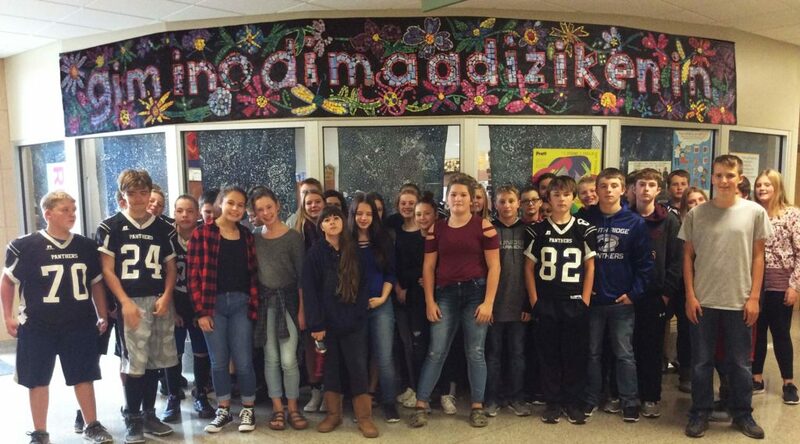 South Ridge 8th grade created hand painted tiles for this 30′ long mosaic mural of the Ojibwe word giminaadimaadizikenin meaning we all work together for good. Students studied and redrew flowering vegetables, wild flowers and fruits in the Ojibwe floral design style. These botanicals, which are based on flowering plants from our area in northern Minnesota surround the text. In these days we need something to remind us of each other – how much we need each other. Good work benefits all of us. These days it’s a great reminder that we need to do our best – for all of us. miigwech to Lowana Greensky and Sonny Greensky for sharing their knowledge and language with us.